The Manitoba Moose are proud to announce their team award winners for the 2018-19 regular season. The awards were presented in a pre-game ceremony ahead of today’s final regular season home game against the Stockton Heat. Eric Comrie has led the way for the Moose this season while backstopping the team to a career-high 23 wins. In 45 appearances, Comrie has a 23-16-4 record, supported by a 2.75 goals-against average, a 0.916 save percentage and two shutouts. 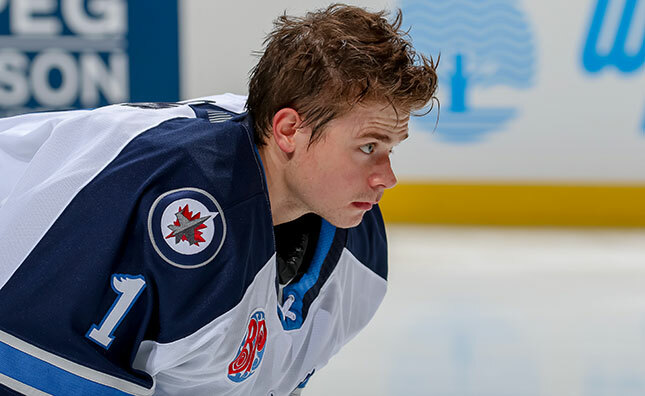 Despite having been with the Winnipeg Jets since March 22, Comrie still ranks third in the AHL in saves and fourth in minutes played. Comrie is the first goaltender in franchise history to play over 10,000 minutes and make over 5,000 saves in his career. He now ranks second on the club’s all-time leaderboard with 75 career wins. The Edmonton, Alta. native was recognized by the league this season as the CCM/AHL Player of the Week for the period ending Jan. 20. Tucker Poolman has enjoyed a breakout campaign in his second professional season. Appearing in a career-high 43 games with the Moose, Poolman has 25 points (5G, 20A) to his name while maintaining a plus-four rating. Poolman ranks second among Moose defenders in point production and is tied for the team lead in goals from the blue line. Impressively, the East Grand Forks, Minn. product has only accumulated 10 penalty minutes this season. Logan Stanley has been a stalwart as a member of the Moose defence in his rookie campaign. Appearing in all but three games this season, Stanley leads all Manitoba rookies with 19 points (5G, 14A). That mark also places him 17th among the league’s first-year defenders. The Waterloo, Ont. native is fifth among the league’s rookie defencemen with 137 shots on goal, and is tied for the club lead for goals by a defenceman. In his first season serving as the team’s captain, Peter Stoykewych has been an integral part of the team on and off the ice. Named as the team’s winner of the IOA/American Specialty AHL Man of the Year award, Stoykewych has participated in numerous community events and post-game meet and greets. He will also be featured in a public service announcement with the Winnipeg Police and CAA, and has been a guest columnist in ‘Game On’ magazine, sharing his professional experiences with the next generation of hockey players. Eric Comrie has dominated the Three Stars standings, racking up 32 star points on the season. Comrie was named the first star of the game in nine of his 24 appearances on home ice, while earning second star honours twice and receiving one third star nod. The Moose MVP was exceptional at Bell MTS Place this season, posting an 18-5-1 record with a 2.55 goals-against average and a 0.930 save percentage. This award will not be handed out until the conclusion of the regular season. At this point it’s a two-man race for the Moose scoring title. Seth Griffith currently holds the team lead in scoring with four games left on the schedule. Griffith has 52 points (15G, 37A) on the campaign, a five-point edge over Logan Shaw at 47 points (27G, 20A).